The Seattle Mariners traded catcher Jason Varitek and today’s Beantown Baseball Birthday Celebrant to Boston for closer Heathcliff Slocumb at the 1997 trading deadline. It turned out to be one of the greatest deals in Red Sox franchise history. Varitek became the captain and anchor of those great Red Sox teams that won two World Championships during the first decade of the new century. 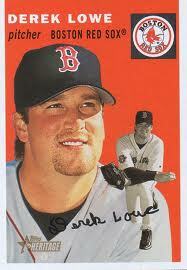 All Derek Lowe did for Boston was first become the team’s ace closer for a couple of years including a 42 save season in 2000 and then convert to the Red Sox starting rotation and become a 20-game winner in 2002. He also pitched brilliantly during the 2004 postseason culminating in Boston’s first World Series victory since 1918. And then surprisingly, Boston let him walk away as a free agent. Lowe was born in Dearborn, Michigan in 1973 and after graduating from high school there, he became the eighth-round choice of the Mariners in the 1991 MLB amateur draft. It took him right about six seasons of minor league ball to earn his first start in the Majors in 1997. When Boston acquired him that same season, they sent Lowe right to the bullpen and with the exception of 10 starts during the 1998 season, he was used strictly as a reliever and then closer until the very end of the 2001 season, when he made three consecutive starts. That turned out to be a preview of what was to come for the big 6’6″ right-hander. His career in Beantown ended right after Lowe pitched great during the 2004 postseason, winning all three of his decisions. The Dodgers outbid everyone, including Boston for his services. He left the Red Sox with a career record of 70-55 with 85 career saves. His big league career ended in 2013. His lifetime record was 176-157.